Nanuq stranded in low tide. The boat had just been stranded. The right daggerboard, the one on which we were supposed to put the sonar, was broken, stuck, but still attached to the boat. We quickly tried to get the boat out: first with engine; then with a rope attached to the mast, pulled by the dingy; and several other techniques that didn’t really worked. We were fighting against time. 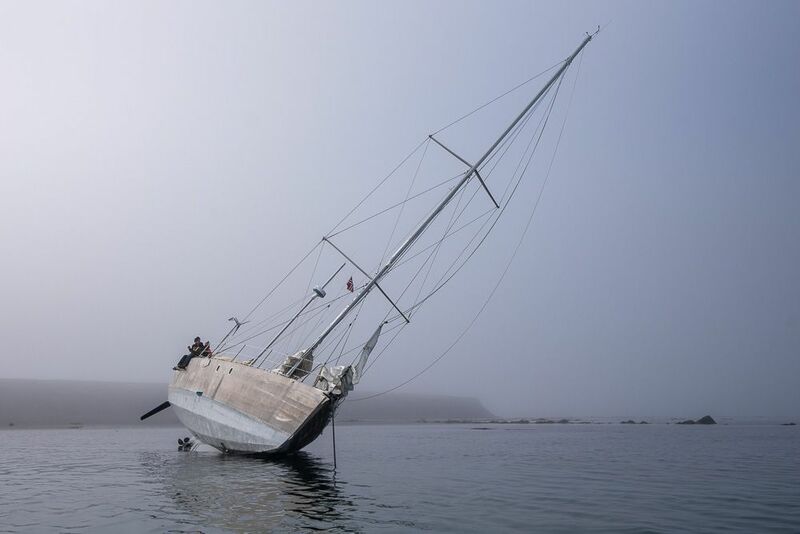 The tide was getting lower and lower, and the daggerboard was still stuck. We ended up cutting it in two halves it with a saw, and we put the broken piece on board. After that, the only way out was to wait for the tide to come up again: 12 hours at least. We were not even at 1/3 of the low tide yet, and we were already inclined more than 49 degrees. “Absolutely. You cannot imagine the story. I was sleeping while it happened: there was a big crunch noise and everyone was rushing out. I jumped into tender with Kai with 50m rope and started pulling mast sideways while 8 belugas were surfacing around us. Then mist lifted. All the while, a huge reindeer was overlooking it all from a cliff! 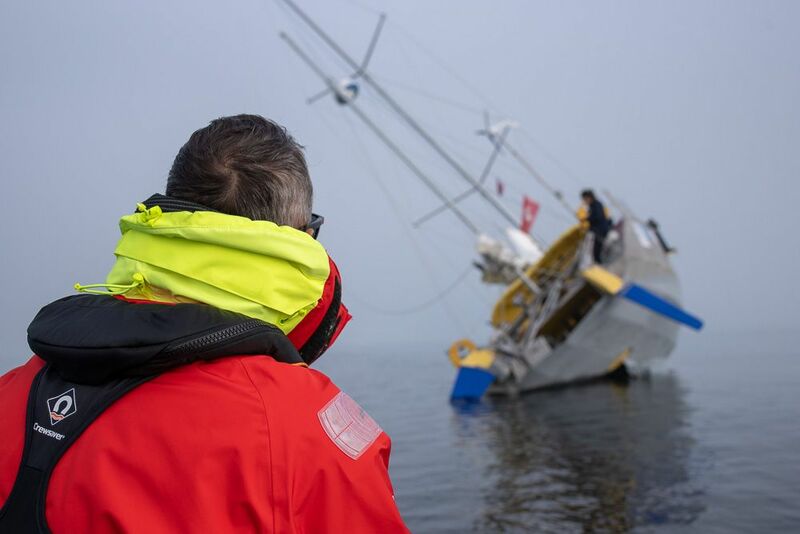 Inspecting the stranded Nanuq on its side during low tide. “However, 12 hours later, we were sailing again, heading to a new bay to moor. Once we were at sea, we could finally relax. 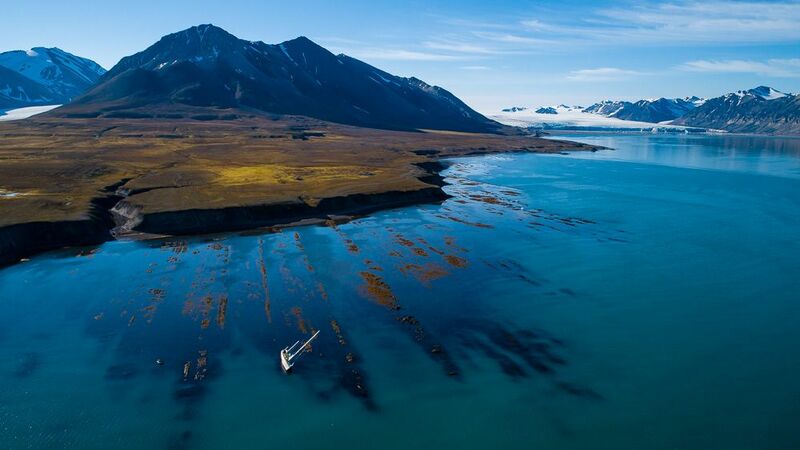 We did several long walks, visiting deserted islands, beautiful glaciers, abandoned homes. During the last 5-hour walk I did with Kai, Alberto, Mike and Ombretta, we first saw some bear footsteps. They seemed old, so we continued. But, almost at the end of the walk, just when we were reaching Nanuq, we encountered several bear excrement that seemed about 6 hours fresh. Not too fresh, but not old enough not to make us feel a little stressed – mainly because we had absolutely no view of the surroundings as we were climbing and then going down every 5 minutes. However, once again, I was surprised how everybody seemed relatively relaxed and, with cold blood and a rifle, we returned home safe.